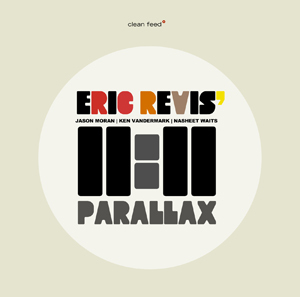 Bassist Eric Revis and his II:II group sure stepped in something good when they got into the studio and recorded the album Parallax (Clean Feed 266). Maybe there's almost no going wrong with a band that includes Revis, Nasheet Waits, Jason Moran and Ken Vandermark! But they do more than just get a session together here; they make a statement! There are a bunch of Revis originals that have historical depth yet are staunchly avant; there are some collective numbers; there are numbers by Vandermark and Attias; and a couple of classics: by Fats Waller and Jelly Roll Morton. It all has real clout--the masters are in the house and they are playing like they mean it. Revis writes things you don't forget. Everybody plays their butts off. The couple of classics get a new wardrobe. Everything goes right! Get this one. Don't hesitate. Grego Applegate Edwards writes this column. 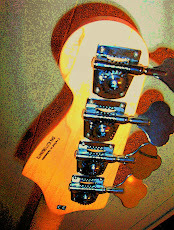 The Gapplegate Guitar and Bass Blog has grown over several years to contain more than 1,000 reviews of CDs by guitarists, bassists, vocalists and otherwise. Each musician is a hero in my mind, a Knight in Shining Armor, devoting a lifetime to music that you can enjoy and treasure. Here are my 1,000 knights, and my many 1,000 nights spent listening so I could review this music for you. If you care about what you hear and want to know more about what is out there, you are the person I have in mind as I write these postings. If music isn't an important part of your life this blog is probably not for you. Various musical genres get attention on these pages: jazz and rock with guitarists and/or bassists playing a prominent role, classical music for the guitar, world music, blues, roots, electric music, vocalists. I cover other jazz and improvisation on the Gapplegate Music Review blog (see link on this page) and modern classical and avant garde concert music on the new blogsite Classical-Modern Music Review (see link). All material copyright 2007-17 by Grego Applegate Edwards.